Our winery is fruit of the passion of generations who over the decades have been delighted by the Landscape and his history. Ficomontanino every day brings to revival the wisdoms and the knowledges of the tradition of Tuscan winemaking through the simple gestures around a fruit, the grape, that includes the essences of the history of the region. Set in the heart of the hills in the eastern part of the province of Siena, in the Municipality of Chiusi, the winery produces wines of outstanding quality, DOCG and IGT, mentioned in the most important wine guides of the country. Generations who dedicated their life to the culture of the good taste: this is our family, since ever engaged in the production and protection of the culture of the Italian “Buongusto”, with its land and its products. Quality and passion year after year have been cultivated, improved, hedged and passed to the next generations, like a precious witness of the best part of Italy. Ruggero, the founder, bought the winery to follow his passion for the nature and the landscape. Because the tradition of the family has always been strictly related to the taste of the products of the Italian culture, it was natural that he implanted the vineyards, with particular care to search for the best quality as possible. Over several years continued the study of the terroir to find out the best way to valorize the unique products of that particular landscape, in collaboration with the enologist Luciano Bandini. After these accurate studies and an endless series of experimentations was reached the excellence. The following generations continued to evolve in this direction. 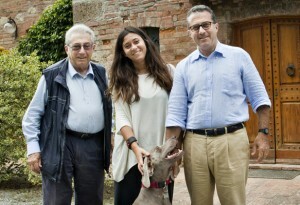 The daughter of Alessandro, Maria Sole, who represents the third generation, is now in preparation to take over the management of the winery, keeping and preserving the principles of her grandfather, creating an elegant marriage in between innovations and traditions.